I recognize that this is very similar to last week’s post – but the zoodle (zuchinni-noodle, duh) / courgetti (courgette spaghetti, obvs) noodle option for spaghetti is tied in brilliance and flavour to the roasted spaghetti squash. With summer winding down, you will want a few good healthy comfort food options to get through the months ahead. This is a great spaghetti squash alternative if you just don’t have time for the roasting part with spaghetti squash. You can either toss the zoodles for 1-2 minutes on high heat in a frying pan or you can serve them raw (which I sometimes prefer). Don’t forget if you’re using jarred sauce and pre-made meatballs to read the ingredients. Trust no one. I’m usually pretty good about reading labels and ingredients but every once in a while I’ll get home from the grocery store and find out that something I bought that seemed so innocent has sugar as a second ingredient. Not fun. Anyway, back to the zoodles. The best zoodles are made with a spiralizer, but a julienne peeler or a sharp knife and determination will get you pretty close. The point is really getting to have spaghetti and meatballs in a low-carb option. This is basically spaghetti salad. Does that sound gross? Whatever. Just make this and love me. Spirallize the zucchini or use a julienne peeler to julienne the zucchini to make courgetti. Heat marinara sauce & cook meatballs according to package directions. Just before serving, toss courgetti in a frying pan with 1 Tbsp olive oil for 1-2 minutes on high heat. 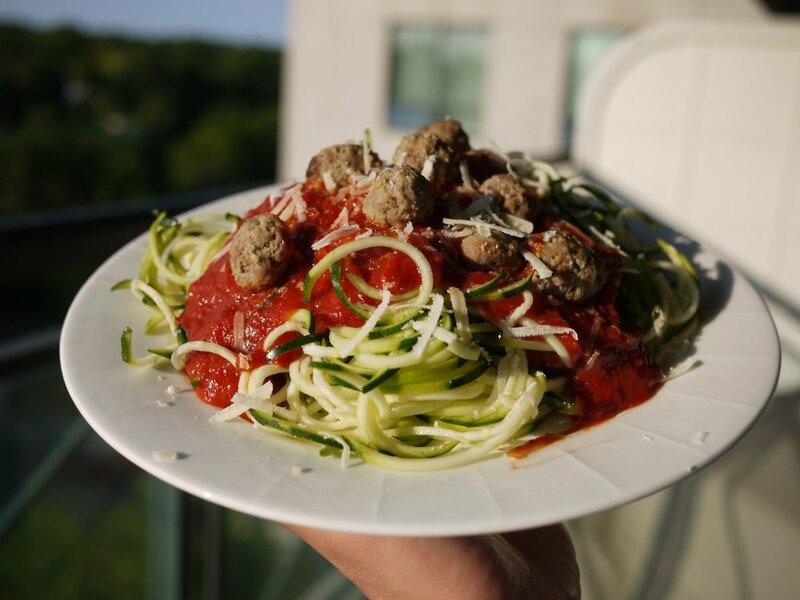 Place zucchini noodles / courgette on plate and top with sauce, meatballs, and optional grated parmesan cheese. Courgetti is also great raw - just omit the frying pan heating and allow the hot sauce to heat the noodles.